Social media platforms like Twitter and Facebook have emerged as a new channel which people are using to express their pleasure or dissatisfaction with a company’s products or services. Many people also make customer service requests and resolve their issues via social media. Smart firms recognize this and are monitoring social platforms to address customer service issues. 1. You can push your issue at the company and wait for the firm to respond to you; versus searching for a phone number and getting trapped in IVR Hell. Essentially you shoot up a flare and wait for a response. 2. Companies want to avoid their customers airing their grievances in a public manner so they will typically respond quickly. Over the past couple years, I’ve used Twitter to quickly and successfully resolve service deficiencies experienced with a major airline, a large financial firm and two local restaurants. I’ve also shared my experiences with about a dozen firms without an expectation of any resolution. In each instance, I followed a similar approach and my issues were either resolved to my benefit in a manner much greater than I expected or I felt a satisfaction that I had helped the company understand how they failed. 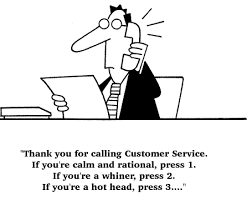 Depending on the size of the company, there may be a dedicated Twitter account for customer service issues. You should use that dedicated account if it’s available. You should also follow the company’s Twitter account so they can direct message (DM) you. You can always unfollow the account later. This is an important consideration that many people using Twitter have a hard time understanding. And something that’s too detailed for this post and is described here. I suggest being discrete at the start. You can always share your concern to a wider audience later. You’ve got 140 characters to convey your issue so use them wisely. Use more than one tweet if you must but don’t feel that you need to provide all the details up front. Those are for later. You want to grab the company’s attention. Even if your issue has you boiling mad, restrain yourself. You’ll catch more bees with honey than crap. And, like the details of your issue, you can always share more about your angst later. One of the benefits of using social media is that you get to push your issue to the company without having to spend excessive time on the phone. Accordingly, you should allow the company time to respond to your tweet. I suspect many firms don’t have a team of people monitoring social media channels. Moreover, your tweet may not have been clearly stated and understood. If the company doesn’t respond within 24 hours, try again or go ahead and use the traditional channel. If you do end up calling the firm, be sure to let them know you tried to contact them via social media. In almost all instances, you won't and shouldn’t be using Twitter to respond to and/or provide all the details of your issue. Most companies will want you to switch to another channel like the phone or email. Do it. Once you’re in that channel, you’ve set the ball in motion and you’re likely to have your issue resolved to your satisfaction. I suggest avoiding Twitter’s direct messaging feature. It’s too limited and hard to use as documentation. I prefer email myself. If you’re someone who expects a certain level of customer service, you should consider using a social media platform like Twitter to help you resolve your issues in an efficient and worthwhile manner. For more information, ideas and tips on using social media, consider following me on Twitter.